Earlier in July, Maxine Fookson and her husband, Ned Rosch, were watching a PBS Newshour segment about displaced Iraqis in Fallujah when they saw Mustafa Ahmed Abed, a 13-year old boy they helped eight years ago. In 2008 Maxine and Ned established their own Portland chapter of No More Victims, a nonprofit that helps to bring children wounded by war to the U.S. for treatment. One of these children was Mustafa, who lost his leg at the age of 2 in a missile strike in Fallujah in 2004. A Fallujah doctor reached out to No More Victims, and at age 5 Mustafa came to Portland with his father Ahmed. Mustafa received treatment and was fitted for a prosthetic leg at Doernbecher Children’s Hospital and Shriners Hospital. Mustafa remained in Portland for over three months and was received warmly during his stay. He “embodied the tenacity to keep on going after horrific things that had happened to him,” said Ned. 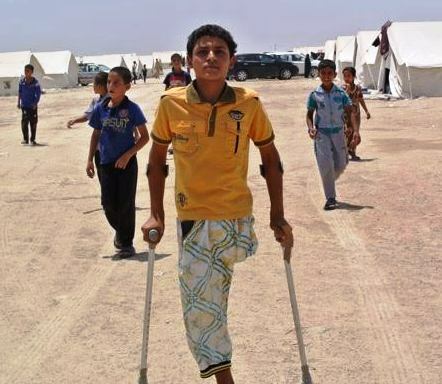 The plan was for Mustafa to return every couple years to be fitted with a new leg, but by 2010, Ned and Maxine had lost contact with Ahmed because of the limited resources for communication in his family’s village just outside Fallujah. However, reporter Jane Arraf met Mustafa in the camp where he and 30,000 people are currently living outside the city. ISIS has barred people from traveling to other provinces within Iraq and they are unable to return to the city, which is heavily damaged. With Jane’s help and Ahmed’s passport and old travel documents, Mustafa was able to reconnect with the couple that had helped him. Maxine, Ned and an Arabic-speaking couple to help translate sat down and were able to finally contact Mustafa over the phone. The connection was poor and their conversation was brief, but they could hear one another again. “We just kept saying ‘We love you, we love you,’ and he said, ‘I love you,'” Maxine said. Unfortunately Mustafa has had to go without the medical supplies that he desperately needs in the bleak conditions many are now facing. Ned and Maxine are fundraising through Oregon Physicians for Social Responsibility to get medical supplies to Mustafa in the camp.